Whoa! Is the rifle in one of these boxes bearing my name? I was moping around the prezzies I did get when TW brought out a new package of foam rockets, only they called them missiles, which is fine by me! This package had 5, instead of 3 for almost twice the fun! I was in heaven while Pop and TW took turns entertaining me. I did do some serious biting on the smousie from Sukiroo earlier in the day when I thought the peeps weren't looking. I'll do a review in a few days. I also loved my Colorado Catnip quilt. Of course, when the camera came out, I got shy and wouldn't perform. I must add that I won every present I got today. The peeps never opened that HUGE box that they bought me. I have to wait until Balsam leaves to get that. I'm gonna sell tickets to watch Pop assemble it. MOL! My Colorado Catnip quilt folded in half. Do I look nipped up or what? You can see some of the missiles. Before dawn when I was looking to see which packages were for me. There was plenty of discarded tissue and wrapping paper strewn about the floor for me to roam through. On my Tree of Pain waiting for TW to shoot a missile at me. Another photo among the wrapping paper. Please disregard the quality of the photos. They're dark cos I wouldn't let TW use the flashy light and grainy cos she was using a high shutter speed to try to offset that there was no flash. We've agreed the only way I'll let her take my picture is without flash. We tried to lighten them in Photoshop with limited success. Let's just say that if TW was looking for a festive picture for next year's Christmas card, she struck out. CK, be glad there ARE pictures to document the event. Our humans got all the present opening done with us out of the room and all their pictures are of THE BABY! We just got our gifts unceremoniously later. Hmmmmffff. You look like you had a wonderful Christmas. What a great day you had Keisha. Have a wonderful Wednesday. It looks like you had lots of fun on Christmas! Bummer that you have to wait for the big package to be opened and put together though! We think your photos are just great. 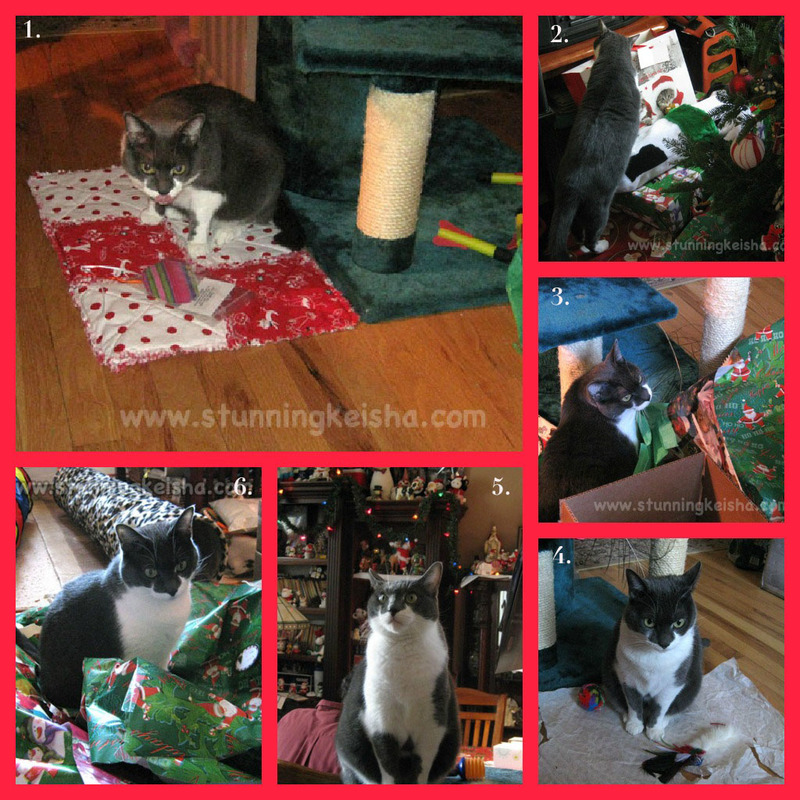 We're happy you had a purrfect Christmas, dear friend. Abbi is going to post what she did on our blog tomorrow. I am glad you hadma great Christmas CK! Let's go open that big box! We hope you had a wonderful Christmas! Love from the Zee/Zoey gang! You seem to be having tons of fun with all that wrapping paper and your presents! Those pictures look really good to us! CK ! You keep me have owl eyes ! What's inside da big box ? I'm dying to know ! Hope that big box gets opened and put together really soon. We want to see too. The pictures don't look bad to us. Take care. Woo Hoo , you scored BIG time CK ! Looks pretty great to us. Our peeps were sick and whining around. At least yours TRIED to entertain you! Pee ess - keep making the woman work for those pics! You make us proud to be kittehz, CK! We're glad you had a Merry Christmas! We totally TOTALLY loves our sukiroo mousies - they gotz loads of slobber on them! Looks like - except for the assault rifle of course - that you scored some decent loot this year! Your pictures looks purrfect! Me won't lets Mommy use the flash either. We is still working out how to gets things looking good too! Great presents. Too bad about the semi-automatic weapon though. Maybe next year? I think your photos are great CK. I don't have any luck taking pictures period. Our house doesn't have much light and if I use a flash, there is too much glare and Mario doesn't like it. Just can't win! Wow, CK...that is QUITE the haul!!! ..and you won everything! Impressive. Can't wait to get a ticket for the assembly of the mystery prize! ...tell TW that she did a fine job with the camera. The photos aren't dark at all, they're great! She's very smart to try to get you with natural light. It brings out the STUNNING in Cathy Keisha. Darling CK, for some odd reason, I am enamored of picture #2 showing off your sleek and furry back, your lovely sleek tailio and those sweet feets! I could gaze upon you all day! The Human finally came home today and I am ashamed to admit I was sooooo happy to see her. That's not very Manly but I couldn't help myself. It looks like you had a great Christmas, my sweet! Glad you had a nice Xmas cousin! Those missles look like fun. CK truth to tell you don't want your nip habit exposed for all to see!!! Looks like you had a great Christmas and are enjoying your prezzies! Have a happy New year! Looks like you had a wonderful time! Merry Christmas! My Human tries to avoid the flash also, mostly because it shows too much of the fur and other stuff on the carpet and then she has to vacuum too much with Photoshop, ha ha ha! Looks like you had a nice Christmas! Happy New Year! 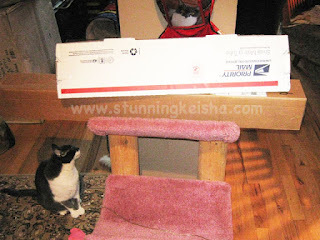 CK those are some great prezzies especially the Colorado Quilt and Cat Tree. Those Natural Cathy Keisha photos really show off your whiskers very cool. Actually we think #6 would make a very nice card. Those prezzies sound terrific.